The first time I heard this quote was at Donald Miller’s Storyline Conference. 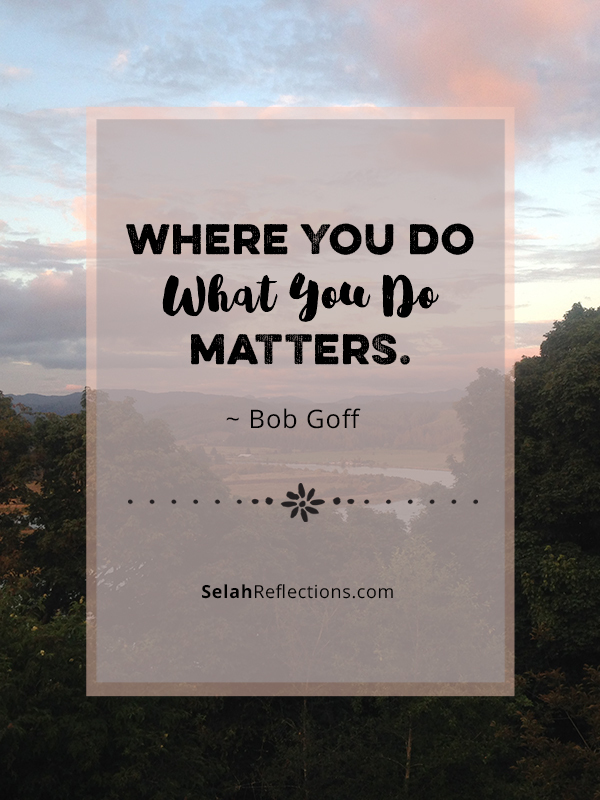 It was something that his friend and author, Bob Goff, had said to him. It’s one of those quotes that sits with you for awhile as you work on understanding the meaning. Since then it has become one of my favorite quotes. It’s a concept that reminds me to pay attention to my environment while I am working, adventuring, or resting. My personal definition is that your environment matters since it can strongly impact your stress level and your ability to find stillness and rest. When you work in an office cubicle without a window how do you feel? If you are an introvert in the middle of a huge room with 100’s of people, how do you feel after an hour? When you are in a doctor’s waiting room that feels shabby and “doctory,” how does it make you feel? 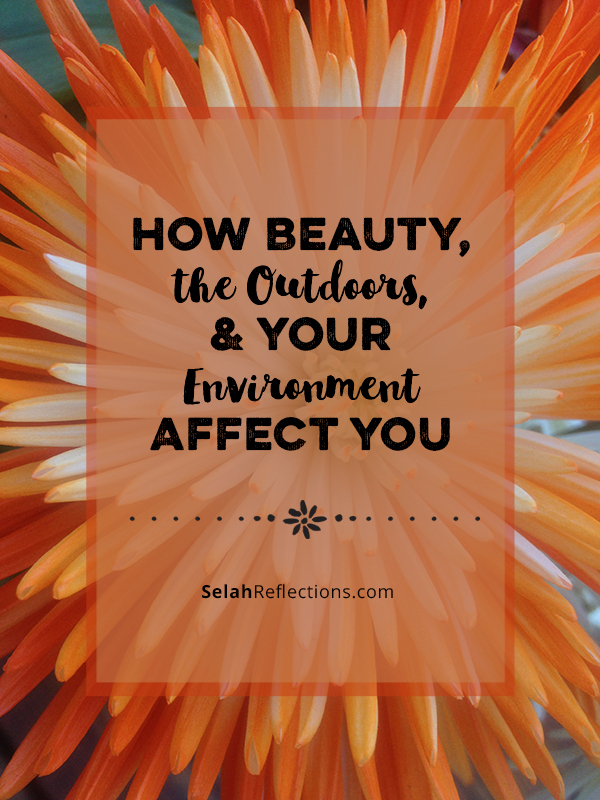 Access to the outdoors is pretty important to me; so when I relax, I like to be outside. On the days I can’t get outside, or when I am at work, bringing the outdoors in is the next best thing. I can do that by using my photography as artwork on the walls, opening a window to catch a breeze or hear the birds sing, and working in an area where I get a lot of natural light. I’ve even tried plants! But that doesn’t usually go so well. So, How Could You Apply This Idea In Your Life? First, there are some questions you need to ask. When you are looking to find stillness in your life what is important to you? Is it beauty? Quietness? A soft fluffy blanket? Beautiful background music? A cozy room surrounded by family? Maybe it’s sitting outside in the sun with a great book? If you are not sure, as you go about your day, start to notice where you feel the most relaxed in your home, office, and other daily activities. Keep notes about how you feel, how your tension levels rise or fall, and what makes you feel relaxed. I bet you will start to see a pattern. A Reading Spot: What about a favorite chair with a soft blanket and a great smelling candle? A Workspace or Desk: I’m partial to a collection of all sorts of colored pens! 🙂 Family photos, inspiring quotes or photography, a vase of flowers. You even can find fun colored desk accessories. My Mom used to decorate her bulletin boards with gorgeous wrapping paper. She is also a HUGE fan of fun floral decorated file folders! Family Dinner Table: What about making it regular habit of having a candle light family dinner? Does soft background music help everyone calm down a bit? Fun placemats, flowers on the table? A Resting Spot: Do you have a favorite park with benches? Is there a lake you like to visit that is quiet and warm, where you can hear the birds sing? Growing up my Mom had a set of fantastic books by interior designer, Alexandra Stoddard. She is someone who totally gets the idea that “where you do what you do matters”. She emphasized using colors you love, using texture, and style to create an inviting home. Living A Beautiful Life, Alexandra Stoddard’s Book of Color, and the Gift of a Letter are some of my favorites. While her style of decorating is not my style, her advice and ideas are. For most people (but certainly NOT all!) clear, uncluttered, simple spaces to live, and work in, is soothing and calming. Next time you walk into your kitchen, start to notice the difference in how you feel when the sink is full of dirty dishes vs. an empty sink. How does it affect your emotions and how do you feel about your kitchen in general? Natural light, colors, a beautiful view, a gentle breeze, music, a clean desk space, or essential oils diffusing, all of these can make a positive impact as you work. It helps stimulate the creative side of your brain, link together ideas, encourage inspiration, and build confidence. I’ll take that if you don’t mind! Heading up to my office, I find it very hard to start my work day knowing there are dishes in the sink, laundry to be folded, or a desk covered so I can’t even see it or find what I need. When it is time to settle in for the night, I need soft instrumental music, just enough light to read by, a good book, and a soft blanket, then my mind and body starts to relax. It helps me unwind and find stillness as I get ready to fall asleep. First, pick a spot like your desk, a reading chair, or your bedside table and take note of how you feel about it over the next week. When things are piled up on your chair, or files scattered across your desk, or your bedside table looks more like a junk drawer, how does it make you feel? My guess is there might be sighing involved, your shoulders may tighten up, and at times you might just want to leave because it is too much to face. Next, make a short list of what small changes you could make to help that area become a calm, beautiful spot to be in. Are there things you can get rid of? Can you find a better location for files? Is there a candle you can add or essential oils you could diffuse? Would adding artwork you love to the walls be the perfect touch? How about a small bouquet of flowers? These are not huge, monumental changes, and that is good! The bigger the change required, the less likely we will do it. So it’s great to know that small, purposeful changes can make a positive impact on your environment which in turn helps you to find stillness in the midst of life. 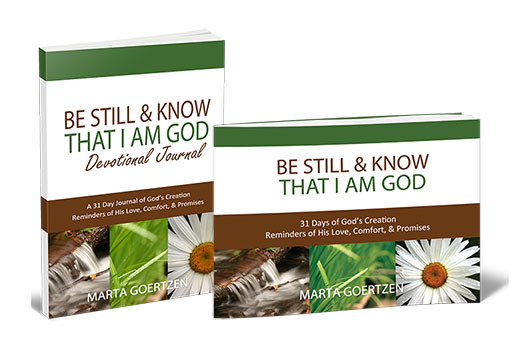 A Fine Art Photo Book paired with scripture and a Devotional Journal can help you find find stillness each day with the beauty of God’s creation and the gift of His words. Click here to find out more. Great ideas, as usual, Marta!